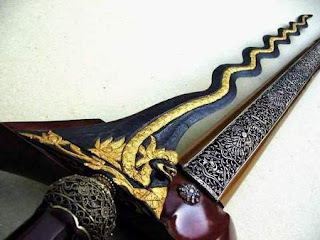 In Indonesian tradition, the keris is a precious traditional sword. It can be identified by its strange shape. The king of Kediri (a kingdom in East Java) was named Kertajaya. He thought himself as a deity and was opposed by the Brahmana (priests). When he threatened the Brahmana, they ran to Tumapel and asked the ruler there, Ken Arok, for protection. Ken Arok thought that Kediri army would attack his territory, and ordered his troops to fortify. The Kediri army came to Tumapel as Arok expected. The Battle of Ganter, in 1222, resulted in the end of the Kediri Kingdom, then Ken Arok formed his own empire, Singosari. After Kertajaya lost, the Kediri Kingdom was ruled by Tunggul Ametung. He had a very beautiful wife, Ken Dedes. A statue in Leiden Museum, Netherlands, shows Ken Dedes as Prajnaparamitha, Goddess of Wise. One day Ken Arok accidentally saw Ken Dedes as a wind hiked her gown. Ken Arok got a vision, that he would have Ken Dedes as his wife at any risk. Ken Arok decided to kill Tunggul Ametung. Ken Arok ordered a keris to be made by the priest, Mpu Gandring. 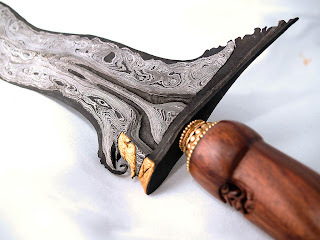 It took a long time to make a keris because only an enlightened priest could make it. Ken Arok was impatient to wait for the keris to be done. His lust for Ken Dedes was getting unbearable. He came up to Mpu Gandring to ask if the keris was completed. When Mpu Gandrig said no, Ken Arok killed him with the incomplete keris. Before he died, Mpu Gandring cursed the keris. After Anusapati's death, his son Ranggawuni wanted the throne. Tohjaya sent Lembu Ampal to attack Ranggawuni and his companion, Mahesa Cempaka. Lembu Ampal realized that Ranggawuni was the right person to be the king, and they fought against Tohjaya. Tohjaya was killed with Mpu Gandring's keris. Ranggawuni and Mahesa Cempaka realized that Mpu Gandring's keris would only make chaos and death, so they threw the keris to the Java Sea. Legend says that the keris turned into a dragon.